After much hand-wringing, the Japanese government finally created a mandatory evacuation zone around the radiation-spewing Fukushima plant. Humans should be safe now. But the same can't be said of the hundreds of thousands of abandoned of animals left behind. In the midst of a hurried and uneven evacuation plan, the creatures—both household pets and domesticated farm animals—have been left stranded. According to The Telegraph and ABC News hundreds of thousands of animals are now on their own in the irradiated region—around 3,400 cows, 31,500 pigs and 630,000 chickens. Prof. D.L Brown of Cornell University's Department of Animal Science speculates almost all of these chickens are dead by now, and that the livestock are in rough shape. Whatever livestock is left won't be around for long—the government is killing them all off as a safety precaution. And then there are the pets. It's estimated that almost 6,000 dogs alone inhabited the radius, though no telling how many of them are still alive. The Japanese government is doing what it can to retrieve stray animal friends, and with the help of nonprofits, trying to care for them or find them new homes. But often, homeowners on government-sanctioned, temporary visits back home are dismayed by what they find. When hazmat suit-wearing 63-year-old Hatsuo Sakamoto came home to quickly check up on his cat for the first time in months, it simply ran away. "The cat must be startled because it has been two months since we last saw it—and because we look like space aliens," lamented his wife. But it's a testament to the love these people had for their pets that they're willing to brave the radiation zone at all—often, just to say goodbye. This was the case for Shoichi Akimoto, one of Fukushima's evacuated residents who had returned for a brief visit to his house. When he searched for John, his dog, he found the pet had died, still leashed, after digging itself a little hole in the ground to rest. 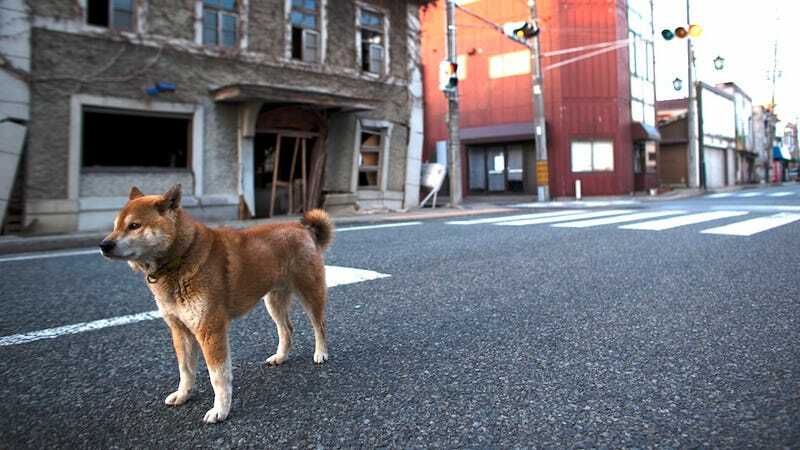 With only 15 minutes left before they would be forced back out of the area, Akimoto and Nobuichi Kobayashi, a local leader, placed incense for the deceased pet beside it, unable to bring his friend back with him. "I will bury his body on my next return," he vowed. Stories like this—likely playing out all over Fukushima—speak to both the psychological turmoil of the disaster, and the tenacity of those affected by it.